I just launched Autodesk Desktop App and noticed that last month (Nov 17, 2016) there was an update for subscription (maintenance and students) users only. It’s not available on AutoCAD 2017 Downloads but on the other hand on the Autodesk Account. This AutoCAD 2017.1.1 and AutoCAD LT 2017.1.1 Update contains all of the updates previously released for AutoCAD 2017 and AutoCAD LT 2017. Occasional crashes when creating a 3D polyline after an Undo. Occasional crashes when switching to the Top View in some AutoCAD Architecture drawings. Occasional crashes when selecting some objects after using Wblock on certain drawings. Occasional crashes when closing some xrefs after you edit the referenced drawings in place. All lines were displayed as continuous in Excel when they were pasted from AutoCAD 2017 with hardware acceleration enabled. The linetype might be missed on the Ribbon when switching to the light theme. Pressing a Function key during an active command would freeze AutoCAD after updating to the Windows 10 anniversary edition. Publishing might degrade performance when opening some projects in the Sheet Set Manager. Importing certain DGN files might fail. The bubble notification needed to be closed twice when switching to a 3D Visual Style. Customized Edit menu settings might be removed after installing 2017.1 Update. JTB Sheet Set Creator 2.0 is here. 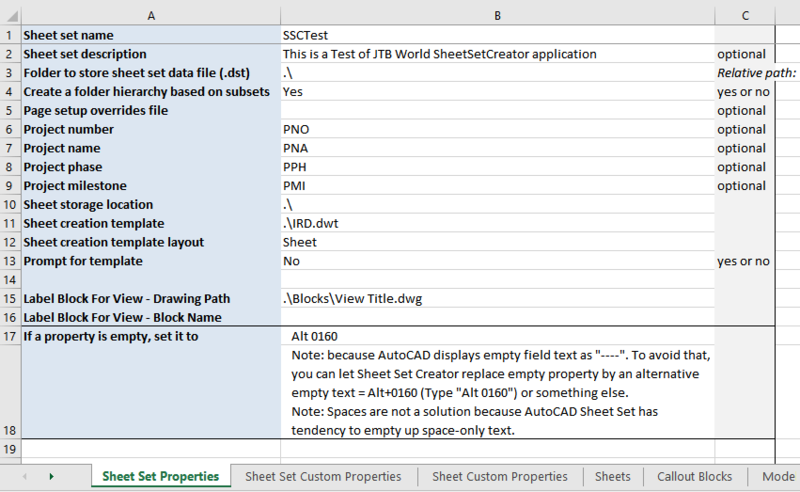 JTB Sheet Set Creator is an app for Autodesk AutoCAD that creates new Sheet Sets and Sheets based on an Excel template for usage in Sheet Set Manager(SSM). Free trial is available for JTB Sheet Set Creator. AutoCAD 2017 for Mac and AutoCAD LT 2017 for Mac are here. User Interface updates, tool sets into two tabs and customizable, File tabs, importing PDFs and running multiple AutoCAD sessions side-by-side, Full Screen Mode and more. Introducing AutoCAD 2017 for Mac and AutoCAD LT 2017 for Mac has all details. RVT Columns for Windows Explorer is now available. With it you can see the Revit version and Revit build in Windows Explorer / File Explorer columns. Even in file dialog boxes within Revit. Now you can know the Revit version and Revit build before even opening the file. Supported extensions and file types are RTE, RVT, RFA and RFT. Free trial of RVT Columns for Windows Explorer is available.